FJM was interested in working with a knowledgeable Islandora partner to help implement a bilingual (English and Spanish) system with 4 core collections, while at the same time building internal staff expertise. FJM used discoverygarden’s services for a variety of services including consultation, design for the initial installation, customized development and migration of metadata from complex internal Microsoft SQL Server databases, merging this with recently digitized content. 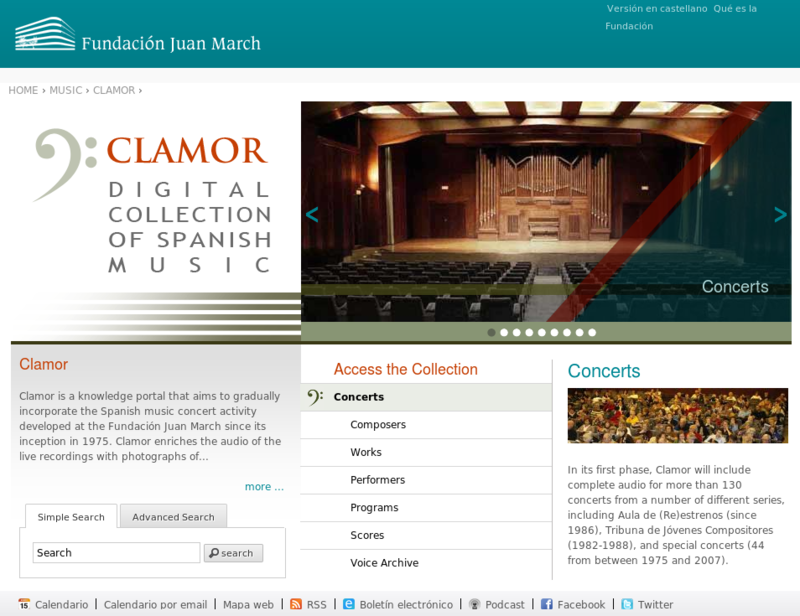 FJM launched with four collections, starting with Clamor (http://digital.march.es/clamor/) in November 2011 and continuing with Antonia Mercé (http://digital.march.es/merce/), Joaquín Turina (http://digital.march.es/turina/) and an Institutional Repository, CEACS. Subsequent to this excellent partnership the FJM team has developed some new collections that build on this work and implements their own innovations within the framework, including Catalogos (http://www.march.es/arte/catalogos/?l=2), which provides access to over 180 exhibition catalogues. Since its inception the FJM repository has reached 1 million files stored and preserved, as well as over 11 million RDF relations between objects. The repository keeps incorporating new interactive and user friendly features such as data visualizations (maps, timelines), multi-device support with progressive loading document viewers and responsive web design and recommendation systems. The FJM project is an excellent demonstration of how organizations can work with discoverygarden to meet tight timelines, building on sustainable and effective partnerships and internal expertise.